Squam Lake is the site of the state's worst decline in the loon population. Loons enjoying the last few minutes of day light in Butternut Lake near Eagle River WI. New Hampshire's loon population is up slightly from about a year ago, but the water bird known for its eerie call is still threatened in the state, particularly at one lake, where just a single chick hatched this year. North America is home to five species. The common loon is the only one that breeds as far south as New Hampshire. According to the Loon Preservation Committee, early numbers statewide total just under 300 pairs of loons, slightly higher than last year. The numbers are down, however, for pairs that are nesting and for chicks that have hatched and survived. 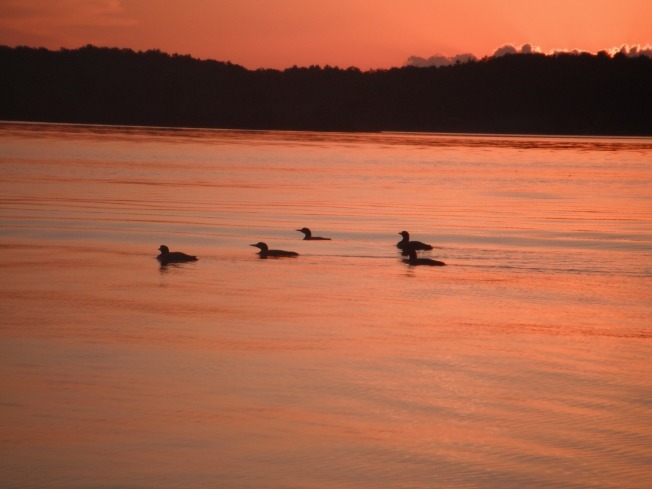 Squam Lake is the site of the state's worst decline in the loon population. The causes include lead fishing tackle that poisons the birds and increased boating and fishing.